Jaisalmer , a sleepy desert city, has transformed itself into a major tourist destination of India. Unlike any other city, this desert fortress is one of Rajasthan's most exotic and unusual towns. Jaisalmer, an important ancient trading centre because of its strategic location on the camel trade routes, is often described as the 'golden city'. The town stands on a ridge of yellowish sandstone, crowned by a fort, which contains the palace and several ornate Jain temples. Many of the houses and temples are finely sculptured. It lies in the heart of the Thar Desert. Jaisalmer Fort was built in 1156 by the Bhati Rajput ruler Jaisal, it is situated on Trikuta Hill and had been the scene of many battles. Its massive sandstone walls are a tawny lion color during the day, turning to a magical honey-gold as the sun sets. Jaisalmer is well connected to the nearby towns and cities. The nearest city is Jodhpur. To visit this place by air, one has to take the flight operated by Indian Airlines between Jodhpur and Jaisalmer. To get there by train there is a meter-gauge train that connects this place with the rest of the small and big places. 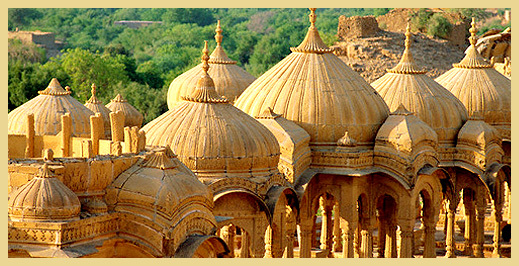 Jaisalmer has some of the India's best hotels, which compliments the scenic and architecture beauty of this Golden City. We at Travel Made Easy, provides you with the reservation facilities of some of the well known beautiful, comfortable hotels in Jaisalmer, to make your stay a memorable one.